Two Expedition 50 astronauts will head outside the International Space Station (ISS) today for the second spacewalk this month to wrap up a power upgrade. Shane Kimbrough of NASA and Thomas Pesquet of the European Space Agency emerged from the station's Quest airlock today (Jan. 13) at about 6:30 a.m. EST (1230 GMT) after switching their suits to battery power more than 30 minutes ahead of schedule. They'll spend about 6 and a half hours floating around outside the station's truss, installing new lithium-ion batteries and adapter plates. 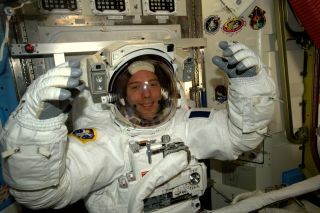 You can watch the spacewalk coverage live here on Space.com, courtesy of NASA TV. In the hours leading up to the spacewalk, Peggy Whitson of NASA and Oleg Novitskiy of the Russian space agency Roscosmos assisted Kimbrough and Pesquet as they geared up in their extravehicular mobility unit (EMU) spacesuits before helping to send the two spacewalkers out the door. For superstitious folks, Friday the 13th may not sound like a great day for a spacewalk. But Kimbrough didn't seem fazed by this allegedly unlucky day when he was asked about it in a preflight interview on NASA TV on Jan. 3. "No, we're looking forward to going out … on the 13th," he said with a smile. Last week, Kimbrough and Whitson successfully completed the first of two spacewalks for the power upgrade; they hooked up electrical connections and installed three adapter plates for three of the six new lithium-ion batteries. Today's spacewalk will be Kimbrough's fourth and Pesquet's first. Kimbrough will be designated extravehicular crewmember 1 (EV 1), which means that he will wear the spacesuit with red stripes. He'll also lead the way when the two astronauts exit the airlock. Pesquet, a first-timer at the ISS, will be EVA 2, and his suit will bear no red stripes.